Armed police under the direction of Westley Chun, Director of the Department of Facilities Maintenance (the pothole fixers) and a small group of City personnel conducted a Bill 54 tagging raid on the (de)Occupy Honolulu encampment on the corner of Ward and S. Beretania this morning around 9:30am. Unlike the previous three raids, the area was not sealed off with crime tape. The group tagged tents, Freedom Furniture, and artwork created for the successful May 25, Off Art After Dark (permitted) event in the park. Since this was a tagging raid, the crews are expected back tomorrow, this time with heavy lifting personnel and equipment. In what has become standard practice, police and crews proceeded to the Victoria Street corner to harass the houseless people there. An excerpt from Nova Smithʻs live stream catches a good example of an ad hoc, yet well crafted shelter that is now subject to seizure. 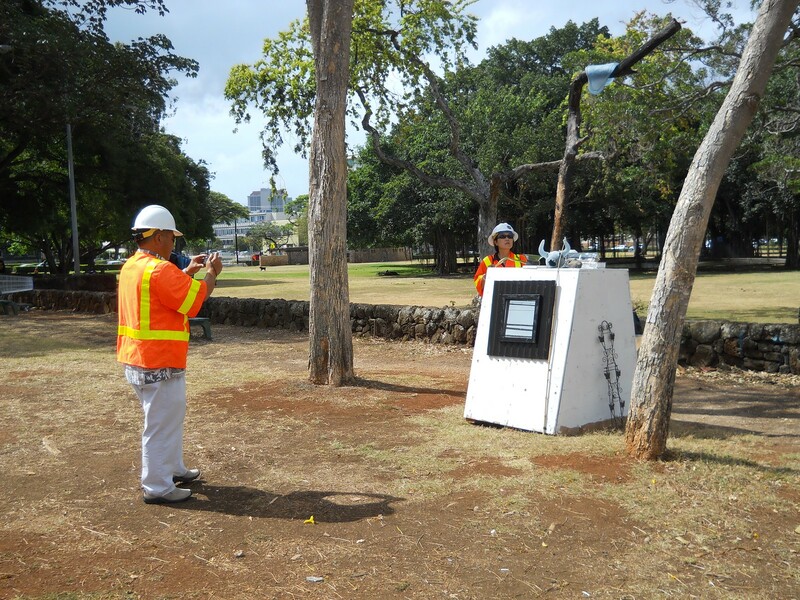 These raids are being led by Mayor Peter Carlisleʻs cabinet level Director of Facilities Maintenance and Engineering. Trish Morikawa is the number two person at the new Office of Housing. Together the two account for almost $200,000 in salary. I will once again making specific requests to the City through Westley Chun for (1) the number of tents or ad hoc dwellings seized, (2) the number of such recovered, and (3) the number of people accepted by service providers. Based on my observation most of the homeless are just set out onto the street in a state of material desperation without shelter, clothing, or food. This sure looks like an armed war by the rich against the poor and peaceful here at street level. The police should be enforcing the law (of the Splintered Paddle, for one) to protect people. The (de)Occupy encampment will rotate tents to those stored on private supporters property and avoid seizure. The City will come in a day or two and seize the Freedom Furniture and replacement furniture will be donated by supporters or gleaned from Makiki sidewalks. (De)Occupy Honolulu is in solidarity with Occupy Wall Street and the worldwide Occupy Movement which asserts that a democratic government derives its just power from the people, but corporations do not seek consent to extract wealth from the people and the Earth; and that no true democracy is attainable when the process is determined by economic power. We urge people to exercise the right to peaceably assemble, occupy public space, create a process to address the problems we face, and generate solutions accessible to everyone. The (De)Occupy Honolulu encampment at Thomas Square Park is the longest running encampment in the worldwide Occupy Movement. Keep up the good reporting Doug. Mayor Carlisle is going to lose the election because of your news reports. If the press does believe this ask Carlisle why he has no endorsement for any Unions? Even his own Police and Fire Department don't support him. The community art group I founded and work with had artworks and art materials taken in a city raid on April 30. The program called The Lovelink Project was to display the artworks at the May Day gathering at Thomas Square Park the next day. It is not known why this small art tent was singled out from other tents and items. If it was somehow confiscated through Ordinance 11-0029 (Bill54) why was their not the required 24 hour notice? It was only a temporary work tent with supervision, erected the nite before. Further, if the property was impounded under this ordinance, today represents the 30th day of impoundment. The city only holds items for 30 days before selling, donating or destroying them under the ordinance. Westley Chun and the Mayors Office refuse to say why the items were taken, but today,have finally requested an inventory from me of the items lost. Chun says the artist paints have been destroyed because they are liquid, and that one of the large art canvases 'Pacific Sustainability' is not in their pocession. I am very sorry for all those who have suffered damages and loss by these constant city raids. The ordinance prohibiting store property on the sidewalk is not to be used to attack fundamental rights of free speech and also can not apply to attacking residents who do not have a home or a place to store their life's bare essentials while at the same time the city ignores its lawful responsibility to provide proper permenent housing solutions. 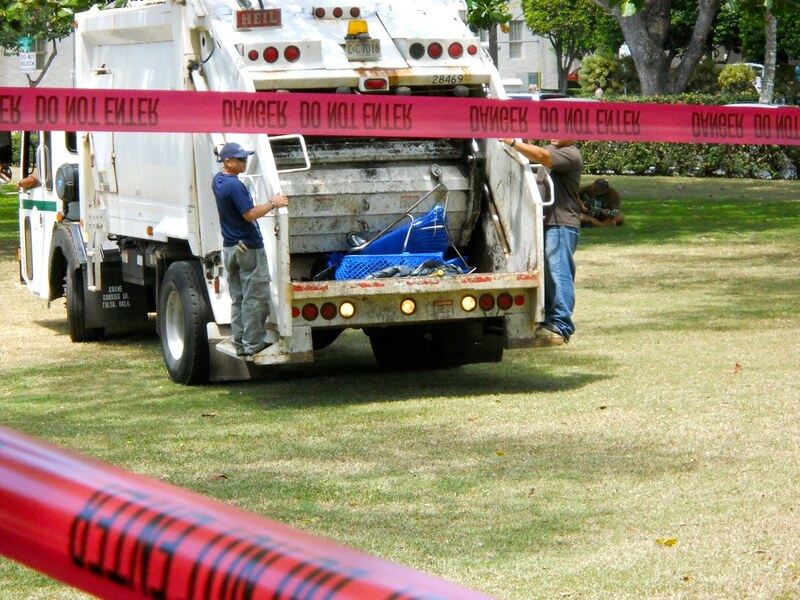 The City and County of Honolulu administers gross mismanagement of its duties and attempts to cover its historic acts of prejudice by escalating their anger, repeating failed ways and attempting to penalize their percieved enemies and inferiors.